Dragon Sculptural Mail Post Outdoor Sculture. You can be sure that the letter carrier won't forget YOUR stop! 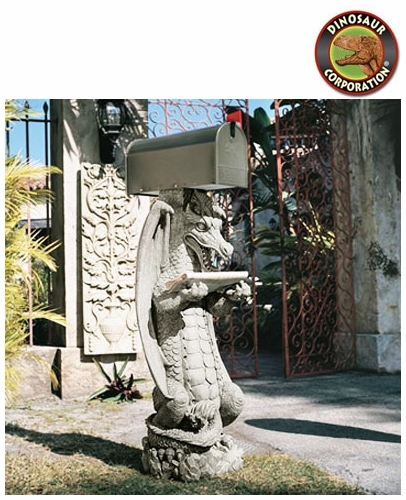 Ingeniously designed to fit your standard 4"x4" post and U.S. regulation-sized mail box, "Zippy the Dragon" holds his arms wide to catch your newspaper and to guard your mailbox as he did those in the "castles of olde." Amazingly sculpted with detailing including scaled dragon tail and toothy grimace, he is cast in quality designer resin to withstand the elements. * Size: 16" W x 12" D x 41" H.
* 4''x4'' post and US regulation sized mail box are not included.